ST. LOUIS (March 29, 2014) – Before a record-breaking 60,213 fans at the Edward Jones Dome, Yoshimura Suzuki’s James Stewart won his third consecutive Monster Energy AMA Supercross, an FIM World Championship, race, marking the 50th win of his career. Monster Energy/Pro Circuit/Kawasaki’s Martin Davalos led all 15 laps to win the Eastern Regional 250SX Class Main Event and extended his championship points lead to eight. 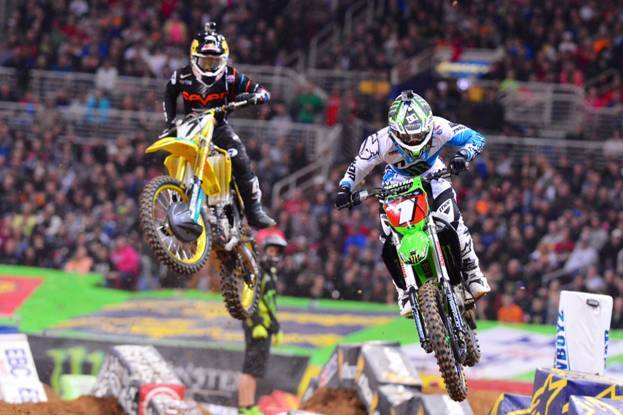 For the first time ever, the entire Monster Energy Supercross season will air on FOX Sports. Catch every Monster Energy Supercross race Saturday night on FOX Sports 1 (fourteen races) and FOX Sports 2 (three races) including next-day re-airs on FOX Sports 1. In addition, the authenticated Fox Sports Go app will air each race at the same time it airs on FOX Sports 1 & FOX Sports 2.